Domingo Villar's very interesting first crime novel, Water Blue Eyes, set in the Galician city of Vigo and featuring Inspector and reluctant radio star Leo Caldas, left us waiting impatiently for a sequel, and it has now arrived, published in the U.K. by Abacus and translated by Sonia Soto. A U.S. edition from Little, Brown is apparently in the works, but I haven't seen any evidence that it's available yet. The title, Death on a Galician Shore, is an adequate adaptation of the Spanish original, which means something like Beach of the Drowned. A body of a fisherman washed up on the shore near a fishing village is assumed to be a suicide, though his hands are tied behind him with a plastic cable tie (apparently a common way for fishermen to drown themselves, though it seems a bit odd). The autopsy confirms drowning, but the position of the cable tie and the presence of a head wound suggest murder. Caldas and Estevez, his somewhat thuggish (though otherwise pleasant) non-Galician assistant, plod back and forth between Vigo and the dead man's home village without finding out much or getting anywhere at all (becalmed, as the narrator says) for most of the novel. That's not really a complaint: it's not only a good depiction of police work, it's an opportunity for the reader to soak in the atmosphere of the village and the life of the fishermen. A link to a more-than-a-decade old incident involving the dead man, in which a ship on which he was working sank, drowning the captain, brings in ghosts and the talismans that the fishermen use to ward off evil spirits, a theme constantly raised by Caldas and others and dismissed as ridiculous by Estevez. We also learn more about Caldas's family (mainly his father and an uncle) and his lost love (who walked out on him a while back), and about food and what might be called the cafe culture of retired academics on the one hand and fishermen on the other. The atmosphere and the pace shift suddenly when a new thread of the story emerges and from that point (about 2/3 of the way into the book) the story moves very quickly from one theory of the crime to another, as Caldas is convinced of each in turn and tries to act on them. Having already met the other men involved in that earlier shipwreck in the first half of the novel, we learn a good deal more about them in the last sections, as their role in the various scenarios changes and changes again, Caldas leaping from each newly discovered clue to a conclusion that may or may not be supported by the facts. By the last few chapters things are changing almost too fast, though some of the melancholy turns of events and the buried facts and motivations reminded me a bit of Leonardo Sciascia's subtle delineations of crime in Sicily. Having set up Caldas as a character very thoroughly in Water Blue Eyes, Villar doesn't take his personal story much further in the new book, perhaps part of the reason that the early sections seem a bit slow, A reader new to Villar might find them much more packed with detail and incident. 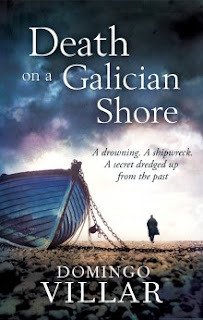 But in any case, Death on a Galician Shore does provide an interesting take on the "locked room" or village mystery, with a limited set of suspects but a sudden shift of perspective at the end. The atmosphere is interesting and the melancholy tone wholly appropriate to the crime and the ultimately discovered motivation and back story. 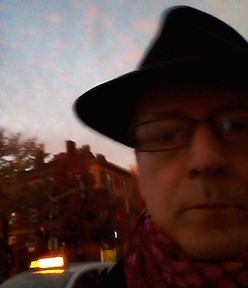 My interest never flagged, though I was starting to get frustrated with the pace just as it began to pick up. Very good summary/review, Glenn. I agree that the author did not take the personal story of Caldas further since the (excellent) first book, or the dynamics between him and the assistant (who was funnier in the first book). But I liked this novel a lot, for the reasons you say and also the father (his "book of idiots") and uncle, and their relationships with Caldas. It is quite an "old fashioned" plot but I did enjoy it, if not quite as much as I thought I might.